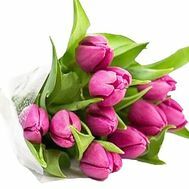 A bouquet of tulips can bring not only joy and pleasure from its contemplation, but also to lodge warmth, restore faith in the best and beautiful. 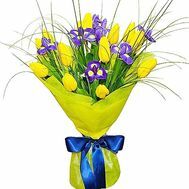 This sunny primrose is a true decoration, an unforgettable gift of nature. 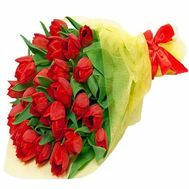 A huge bouquet of tulips is a kind of flower therapy that raises the mood, raises morale and causes a rapid heart rate, the rhythm of love. 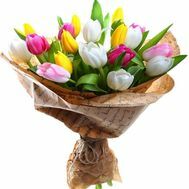 So there is no gift for a loved one better than a bouquet of tulips. 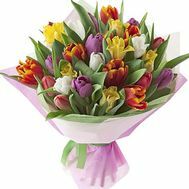 The price for it in our store is always acceptable, and the delivery is fast and reliable. 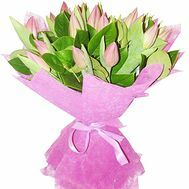 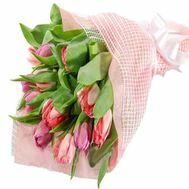 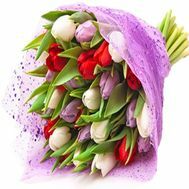 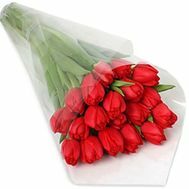 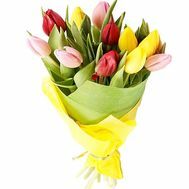 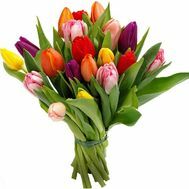 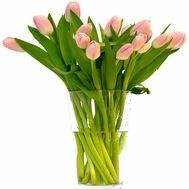 So you can buy a bouquet of tulips at any convenient time for you, because we guarantee timely delivery directly to the recipient! 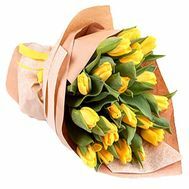 What does a bouquet of beautiful tulips mean? 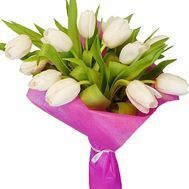 Tulips are a deeply symbolic flower. 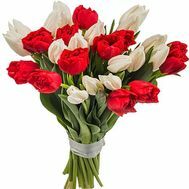 In addition to its ancient and romantic history, which shows them as a symbol of unquenchable human love, they also change their meaning depending on the color scale. 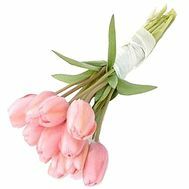 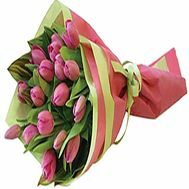 For example, pink tulips speak of platonic love, of young and "fresh" relationships. 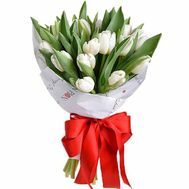 A bouquet of white tulips symbolizes the purity of the thoughts of the giver, his sincerity and attraction towards the recipient. 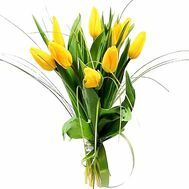 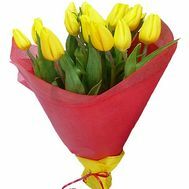 Yellow tulips - the brightest, are a symbol of happiness and joy, fun and friendliness. 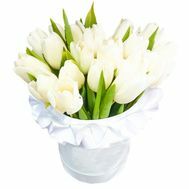 It is also believed that they bring good luck and financial well-being to one particular person, and the whole family. 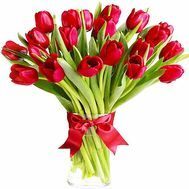 A bouquet with red tulips is a passion and delight, charm and an insane whirlpool of feelings. 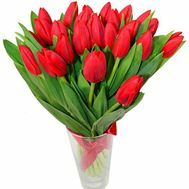 It is the flowers of red shades prefer romance and ardent lovers, full of feelings and emotions. 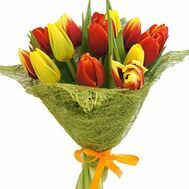 Bouquet of 101 tulips: 101 flower - the number is symbolic. 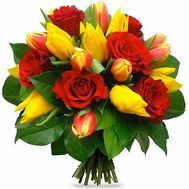 You do not even need to resort to numerology to understand that the person giving such a bouquet is insanely passionate and in love at the same time. 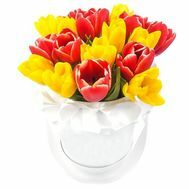 Therefore, each flower will be carefully selected for this huge armful of the best masters of their craft. 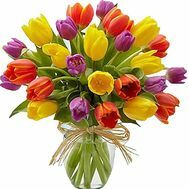 Who can be impressed with a bouquet of tulips? 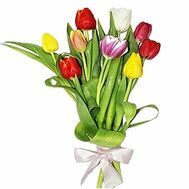 The answer is simple: any person! 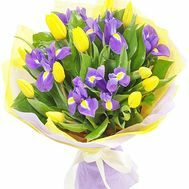 These beautiful flowers are captivated at first sight and a sigh, and therefore have no restrictions in terms of celebrations and people who can be presented to them. 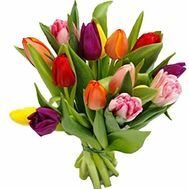 Best of all, these spring flowers will fit into their traditional holiday - women's day. 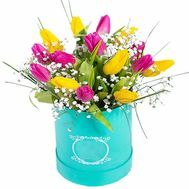 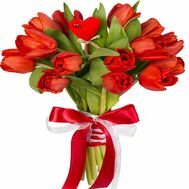 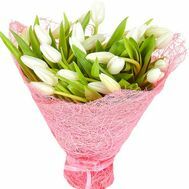 Bouquet on March 8 with delivery to your beloved girl or wife - this is the best gift that you can only buy. 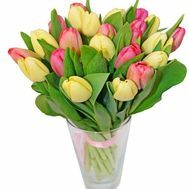 Also our florists can make a beautiful bouquet from the tulips for your daughter's birthday, and you can add a gift to the bouquet in the form of sweets or a soft toy. 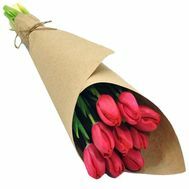 To order a bouquet of tulips means to turn any, even the most usual day, into a real holiday! 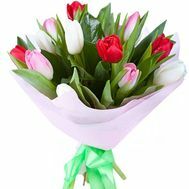 Where to arrange delivery of flowers to the house with a 100% guarantee of quality? 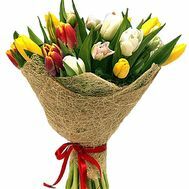 We are the best service in Ukraine for delivery of flowers and good mood. 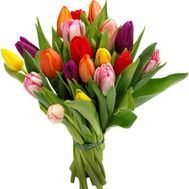 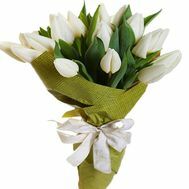 In our store you can buy not only tulips, but also any other flowers, both seasonal or exotic. 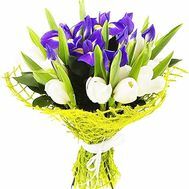 Our delivery service is famous for its speed and reliability, so that the bouquets come to the recipient at their best. 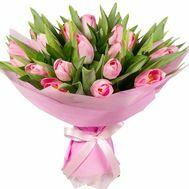 In addition, we provide free shipping in major cities, which will greatly enhance the convenience of your purchase. 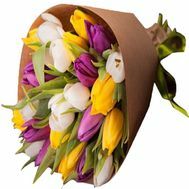 You can also take part in our promotions, or read customer testimonials, see a photo of deliveries made by our couriers before making an order. 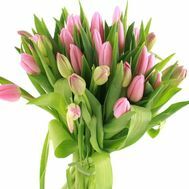 And when you decide - then our friendly managers will gladly consult and help you choose the right bouquet or the composition for the holiday. 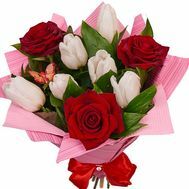 Delivery of flowers from our store is possible at any time, so you can present them as in the morning in your favorite bed, and wish them a good night. 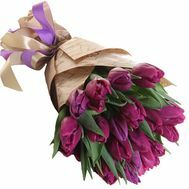 Order a large bouquet of tulips and become one who will see how happiness flashes in the eyes of dear people today!